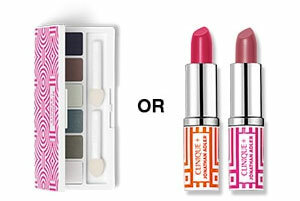 Clinique's latest gift offer is a modern take on glamour in collaboration with the designer Jonathan Adler, who has created a range of products with Clinique featuring his signature design. As part of this collaboration, Clinique has a special offer currently running when you spend £45 you receive a free limited edition 7-piece gift set which has been designed by Jonathan Adler. On top of this, if you spend £60, you will receive a choice of a free limited edition eyeshadow palette or a Lipstick Duo. Now, what do I need from Clinique?! Moisture Surge Concentrate for the changing seasons?! My favourite mascara?! Or maybe I'll just stock up on Take The Day Off Cleansing Balm!